If this rating seems high, it’s only because you haven’t had the pleasure of playing with Dead Weight before. 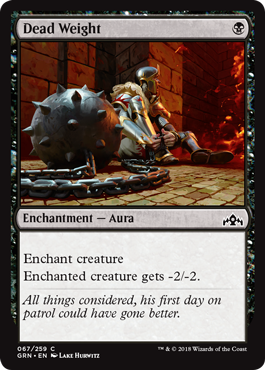 This has a lot more flexibility than Shock, as you can weaken creatures that are too big to outright kill. That more than makes up for the sorcery speed part, and makes this one of the premier black commons. If the format ends up revolving around large creatures, maybe this is a clear second behind Deadly Visit, but the efficiency here is hard to beat.